Newly promoted Fire Inspector Nick Marsan at fire headquarters in Westport. 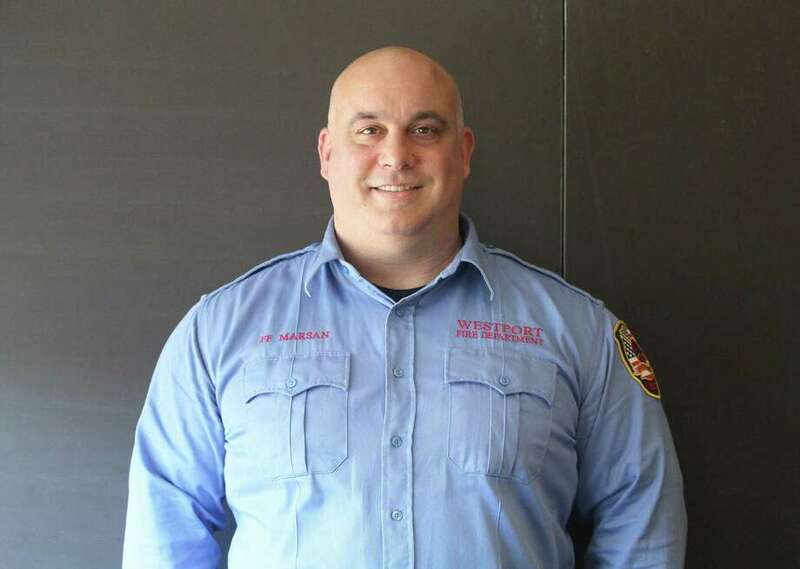 WESTPORT — After a decade of fighting fires in Westport, Nick Marsan is en route to take on a new role, one more focused on the before and after. As a fire inspector, he will be enforcing code to ensure buildings are as safe as possible for residents and firefighters and investigating in a fire’s aftermath. Also the president of the Westport Uniformed Firefighters Association Local 1081, Marsan was promoted in a ceremony Feb. 24. Before joining Westport Fire, he served for eight years in the U.S. Army. When Marsan returned home to Connecticut, he helped with a family business while looking for the right fit. Firefighting seemed natural, a way to help people in need and be part of a team-oriented workplace. Those qualities brought the Norwalk native and current resident, who has family from Saugatuck, to work in Westport. Q: Can you tell me about your new role as a fire inspector? A: Right now I’m in training for the next six months through the state. My two main functions are going to be fire code enforcement and inspection and fire investigation, so those are things I’m in training for right now. When I get done with training I’ll be a certified inspector with the state. Q: Why did you want to become a fire inspector? A: I think the appealing part of being in this department is two-fold. Number one, to be able to investigate cause and origin of fires is a very interesting field, and also because I think the fire code enforcement gives the Fire Marshal’s office the unique opportunity to ensure that buildings around town are safe, not only for the general public but also safe for my fellow firefighters in the chance that they would have to operate in those buildings to fight a fire. With today’s lightweight construction techniques, building collapse is a very serious concern in a fire and minutes definitely count. So if being in fire code enforcement and inspection allows me to identify potential life hazards for both the occupants of the building and the firefighters, then it’s a fulfilling job for me. Q: You also represent your fellow firefighters as president of the local union chapter. Can you tell me a little bit about what you think are the most important things for firefighters in this town right now? A: The members of the Westport Fire Department — the members of Local 1081 — are 100 percent professional and 100 percent dedicated to the life safety and property preservation of this town. We strive to be part of the excellent infrastructure that helps build the brand of Westport. Along with our colleagues in EMS and the police department, we’re in unique position to not always be in the limelight, but are definitely an important part of the infrastructure. Q: This week Robert Yost took over as the Fire Department’s chief after former Chief Andrew Kingsbury retired. What has that transition been like? A: The members of the department, though we already miss Chief Kingsbury and the past five or six years of being able to work under him, we’re excited to provide and work for and support Chief Yost. We want to do anything to help him and this administration be as successful as possible. Q: There’s a study of Westport’s fire services currently in the works. Do you have any thoughts on the study? A: I am pleased that the town’s administration decided to build a strategic committee and do the study. I look forward to the town moving forward based upon the strategic planning committee’s and the consultants’ recommendations for the future of the fire department. Q: What’s it like being a firefighter in Westport? A: I couldn’t ask for a better town to work for, a better department to be a part of or a better group of men and women to call my colleagues and my family.